I always cringe when reading or watching a product review when the reviewer starts with something like “I just got this in the mail today and it is awesome”. Really? How could you possibly know that? You haven’t even begun to test the product at that point. I don’t like to review a product until I feel I have at least used the product for a while and feel I have a good sense of its quality, function and reliability before I make a judgment. Keeping that in mind, this is not a full review but my insights and first impressions of the 2014 Trek Farley. This is not just a new model but something the company has never offered before. I felt it was important to get some information out there sooner rather than later. There will be a follow up review as well as a comparison between the 2014 Farley, and the 2014 Salsa Mukluk 3 and Surley Pugsley. I picked up my Farley on Thursday the 17th of October. My schedule was pretty packed with work and two different choir concerts for my kids so the first ride didn’t happen until after dark on Friday. My son and I drove to a favorite trail nearby and were shocked to find the darkened parking lot completely full. The local ROTC was up there doing some overnight training. We quickly rerouted to another trail system further down the canyon, which was a little less familiar to me and much more technical, but I would not be denied. Dressed for the cooler temperatures we strapped on the skidlids and flipped the lights on. The first thing I noticed on the initial climb was the abundant gears. The Sram X9 2×10 drivetrain was smooth and I found myself pleasantly surprised to find a gear or two that I did not expect. I’ve never been a great climber on the bike. I am usually mashing my shifter in the middle of a climb hoping the granny gear fairy had come by and given me a few more I didn’t really have. The reinforced beefy fork and tapered head tube. The single track on this system is very narrow and deep in places. The darkness only added to the challenge. I found the tread on the Surley Knard tires, with its tread wrapping over onto the sidewall, liked to grab the side of the trail and pick the front of the bike smoothly up and over. This is not a knock on the tires rather an observation on what they are capable of and my lack of better control under the circumstances. I found the tread pattern rolled smoothly over the hard pack and had nice traction in the loose stuff. Salsa hubs. Rumor says that Trek will be coming out with their own rims & tires next year. I haven’t had a chance to compare them head to head yet but the Farley feels a little shorter in the wheel base than the Salsa Mukluk, (which I have ridden a few times), which gave it a nice responsive feel on the trail. I did find the rough spots and washboard sections on the trail felt a bit rougher on the Farley but this could easily be due to tire pressure rather than frame geometry. I don’t have a low-pressure tire gage yet so I know I was running a higher PSI than I normally would have. Adding to the responsive feel is the tapered head tube and beefy fork, an ovalized down tube at the bottom bracket, and the through axle on the rear hub. 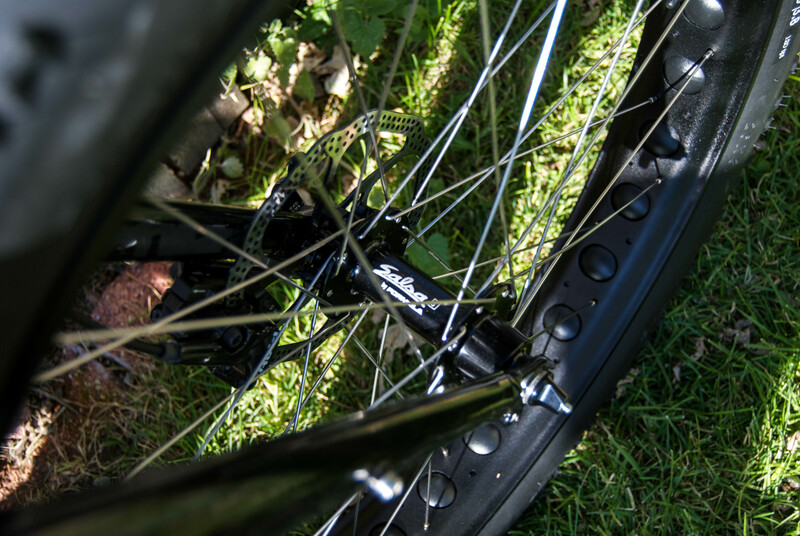 All these features help to stiffen things up and keep the bike going where it’s pointed. I did get it out for a second ride Saturday afternoon. It was a beautiful day on a trail system I’ve never ridden before. It had a combination of double track, single track, and some long grassy sections. The Farley handled very nicely and was a pleasure to ride. It climbs nicely and corners even better. Again with proper tire pressure it will do all these things even better. There was one very boggy section of the trail that was probably ankle deep. The Farley barely even slowed down through it. I think I held it back a bit thinking of the work it was going to take to clean all that muck out of the drive train. The Knard tires stayed on top of the muck, never lost traction or slipped. 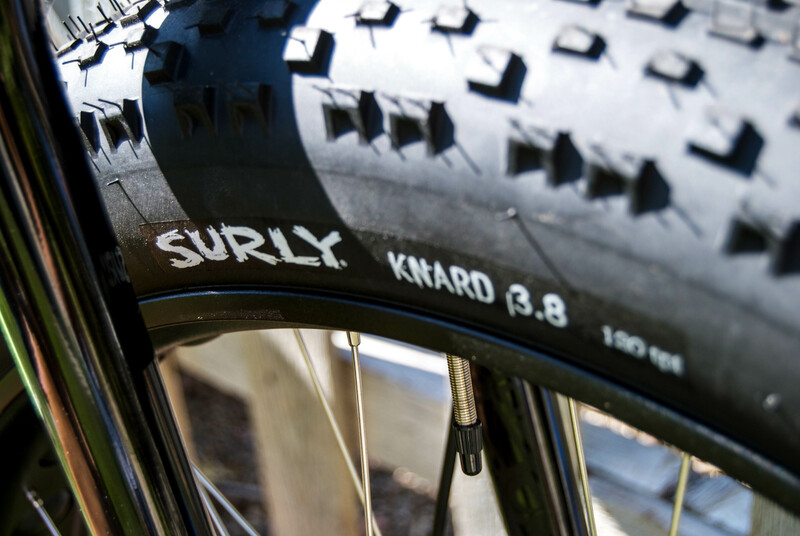 Surly Knard tires. 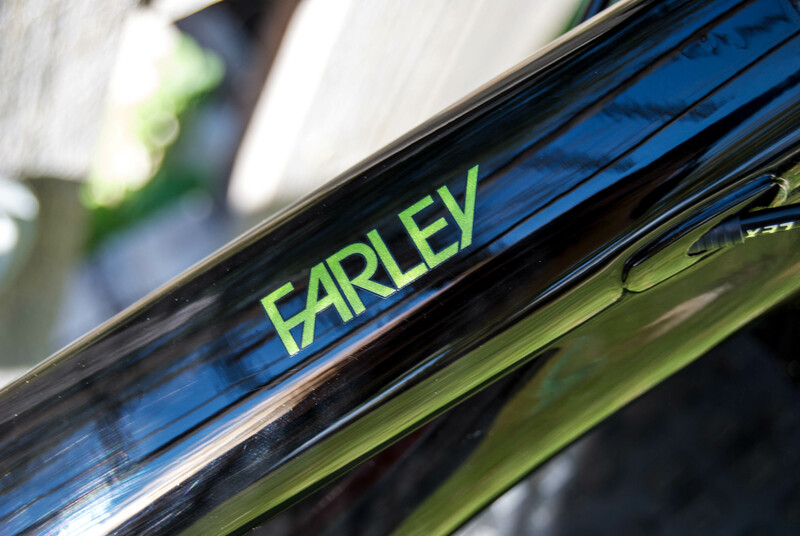 The Farley comes with some stock Surly and Salsa components. I had a smile on my face at the end of the day. Trek has really done their research on fat bikes and has offered something in the Farley that is going to force the other manufacturers to pay attention or get left behind. Weighing in at about 31 pounds on delivery (this was on my 15.5” frame) it is noticeably lighter than many other fat bike options out there. 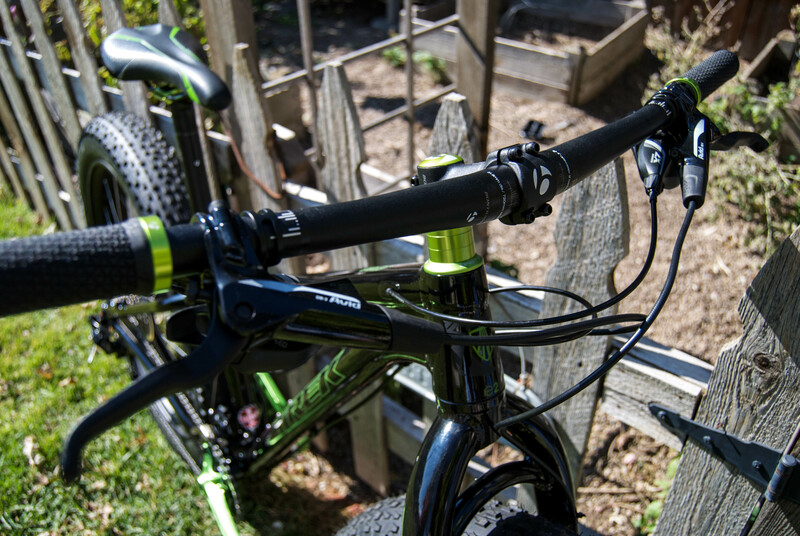 It is lacking many of the bottle cage and rack mounts that are traditionally found on fat bikes from Salsa and Surley. This will limit your options for touring accessories but not eliminate them entirely. There are mounts for front and rear racks but no Three hole mounts up the fork for things like Salsa Anything Cages. However it does give it a cleaner look. The thing that has impressed me the most was the fit “right off the shelf”. I have a difficult build to fit. Stop laughing. It’s not my fault. I was blessed with a very short inseam and longer torso. That means if I don’t want to endanger future generations every time I swing my leg over a top tube that is too high, I get a bike that is too short and cramps me in the saddle. In the past I would extend the stem and run the seat back on the rails. Most of the time I would feel like I was hanging out over the front axle. Eventually I had a frame custom built for me. That was the first time I had a mountain bike that felt right. That bike is about 20 years old now and I still love riding it because it feels so good. I got that feeling again with the Trek Farley. It didn’t dawn on me until halfway through my second ride when I realized everything was in the right place and I just felt right on the bike. To sum up my initial impression of the Farley, I have to say that I am very impressed with what Trek has done with it’s first fat bike offering. It would have been very easy for them to throw up a basic frame and slap on some fancy components to check of the fat bike box on the white board in the conference room. 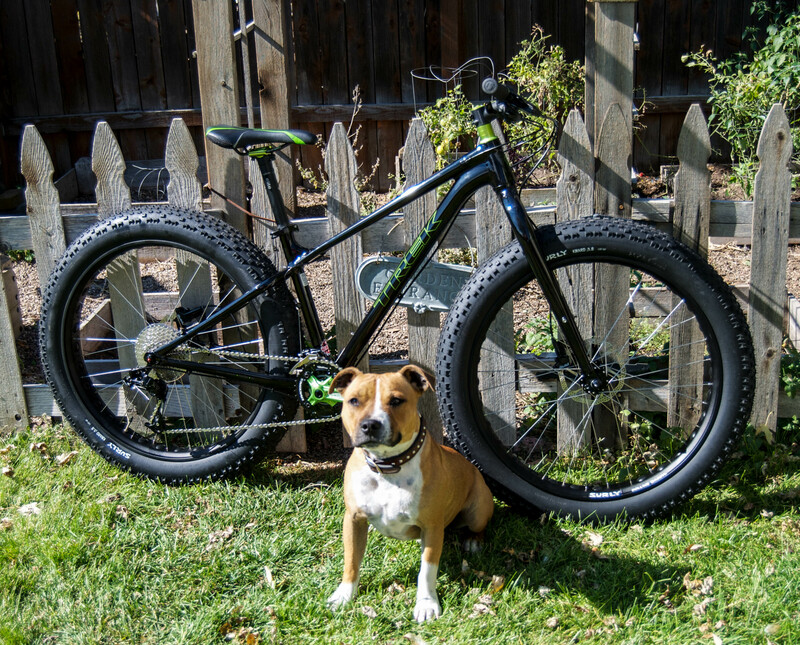 Instead the Farley is designed mindful of a long future in fat biking. 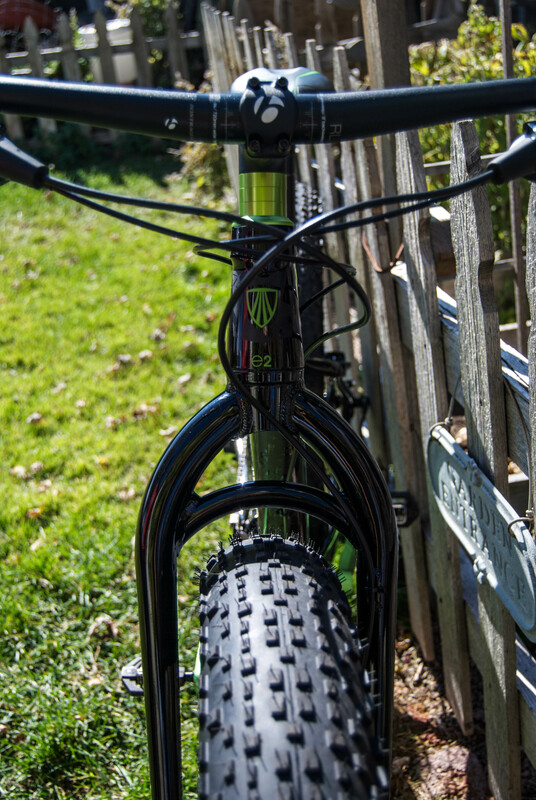 The suspension corrected geometry alone tells me that Trek sees a future in fat bikes. It feels good. It looks good and it is oh so much fun to ride. The Treks are starting to accumulate in our stable. The Farley is definitely the black sheep of the herd but I think it will be getting more ride time than the others, at least for now.